I decided to take a walk around some of the more popular brands yesterday to see how the Christmas collections were faring. Most brands’ holiday collections are already available, but I felt a pull in my gut to check out brush sets for some reason. I knew that 2 brands were doing brush sets for the Holidays this year – MAC and Shu Uemura. MAC’s collection is an annual affair but if I’m not mistaken, this is the first time I’ve seen Shu Uemura come out with a brush set for the holiday season. There are 3 brush sets available this year that come packaged in a barrel shaped pouch. I thought the pouch was nice and practical because you can throw in some eyeshadow or lipsticks and you are good to go. This is unlike previous years where it was clearly just a pouch for brushes. 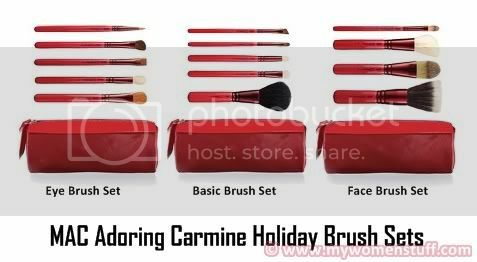 The Adoring Carmine brush sets come with a gorgeous red handle and red ferrule. I love the shade of red used – Carmine I believe. Very eye catching. The 3 brush sets available are the Eye Brush Set, Basic Brush Set and Face Brush Set. The Eye brush set contains 5 brushes for eye makeup. The Face Brush Set has 4 brushes for foundation and powder and the Basic brush set has brushes for eyes, face and lip. Each set retails for RM220 which I thought was a bit of a bargain considering one brush usually costs about RM180 and up. That said, it must be borne in mind that the brushes in the limited edition brush sets are not quite up to the quality of the individual brushes. When the sales assistant opened up brand new sets to show me the brushes, I noticed that one or two were already shedding. Also, I felt that the bristles of the limited edition brushes were not as soft. This might however, be remedied after washing the brushes, I can’t quite tell. Thanks to the helpful sales assistant, I found out that the brushes in the set are full sized versions – we did side by side comparisons with the individual ones. The shorter handles are useful for traveling and for daily usage. I always like the short handled brushes – it makes it easier to use. Fantasy aside, I would probably get the MAC Adoring Carmine Basic Brush set. At RM220 for a blush brush, 2 eyeshadow brushes, 1 angled brush (for brows – its too stiff and coarse for eyeliner) and 1 lip brush you aren’t doing too badly! Add to that the fact that the 2 eyeshadow brushes are amazing – I have a full size for the 239 and I love it for packing colour on because it is so dense. Being a bit of a commitment phobic, I popped over to Shu Uemura to see how their Mika brush sets fared before I made up my mind. 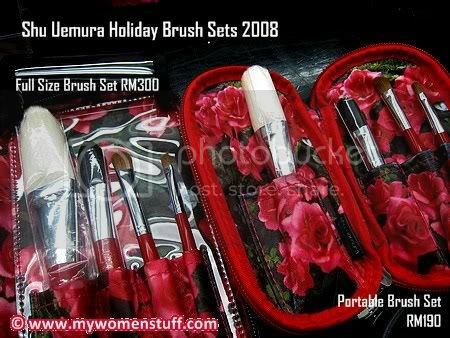 Shu Uemura has 2 sets available – the Full Sized brush set with pouch (RM300) and Portable Brush set with pouch (RM190). The brushes available in both sets are Natural 27 Goat brush for the face, Natural 17 Pony & Squirrel brush for cheeks, Natural 10 Sable & Kolinsky brush for eyes, and Natural 6M Sable brush for lips. I set the two side by side and the portable brush set is clearly smaller sized than the full sized one. I found the blush brush too small in the portable set. I have a Shu Uemura #17 brush that is just a little too small at the head full sized so imagine my horror at having to deal with something even smaller! I prefer nice fluffy blush brushes any day. All that said, in terms of quality, I think the Shu Uemura sets win hands down. The brushes look classier and feel better even if I also noticed a tiny bit of shedding. I do have a full sized #10 Sable Kolinsky brush and these feel about right in terms of density. I did feel that the full sized #27 was a bit floppy. The portable version looked and felt nicer and I reckon would make a nice fluffy blush brush or for highlighters. For just RM100 more, I’d go with the full sized set simply because it makes sense economically and because the blush brush would actually be useful. Again, the shorter handles attract me because its nice for those of us with small hands. However, I think the pouch that the full size Shu Uemura brushes come in is seriously ugly. Sorry to anyone who likes it 😛 The purple flowers on the outside look gaudy and the shiny plastic cheapens the look. I also seriously detest the interior of the pouch! I’m just not a loud flowery print girl so if Shu Uemura would sell me the brushes only without the pouch (but at a discount!) I’d be all over them. The exterior of the portable pouch is plain red which makes sense although I’m still disliking the interior with the huge red roses/peonies all over. If you go to a Shu Uemura boutique, you will get a voucher for RM10 for every RM100 spent (for a limited time). So, RM300 will get you RM30 worth of vouchers that you can use to off set against other Shu Uemura products and you might even snag yourselves false lashes at an unbeatable price! That is the other reason I say the RM300 brush set is more worthwhile economically. And since I was visiting Shu Uemura, here is a picture of the Shu Uemura Mika Eyeshadow palettes (RM195) which are limited edition for the holidays. Unlike many people, I am NOT in love with these eyeshadow palettes. I used to like Shu Uemura (heaven knows I dumped in enough money!) but I feel that this collection is such a miss. I preferred it when Shu Uemura only had limited edition 4 pan palettes. You can go wrong with 4 colours but you can’t go that far wrong. With 8 colours to match, you can go very wrong as in the 2nd palette above. I’d swear there are similar colour combinations found in Silkygirl or In2it (both drugstore brands) for all 3 palettes! The one right at the top and the one at the bottom while not great, have better colour choices to me, but they come with a cream shadow/liner (right most) which for me is like putting lipstick in a palette. You always have a risk of powder getting all mixed up in it and looking gunky. The cover of these palettes bear the same flower theme which epitomizes the Mika Ninagawa work of art. The palette is slim and compact but to me, felt like the ones that Coffret D’or Party Palettes come in. I will not fault the quality of the eyeshadows – nothing beats the silky smoothness and pigmented shades of Shu Uemura powder eyeshadows and at RM195 for 8 colours, it is a steal. 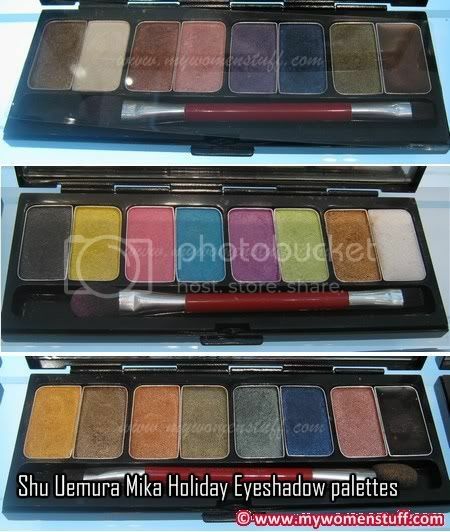 Still, I’m not liking the Shu Uemura Mika Holiday Collection simply because I feel they look cheap (although they really aren’t). MAC brush set or Shu Uemura brush set? At the end of the day, I’m left wondering whether I should bother getting a brush set (it’ll be so useful when travelling) from MAC or Shu Uemura. I’ll have to really think this one through! 😛 Then again, I have the luxury of already having other brushes in my collection. For brush newbies, I’d go out on a limb and recommend the MAC Basic Brush Set. First off, you get 5 decent brushes for cheeks, eyes and lips in a nice red pouch at RM220. Secondly, the 2 eyeshadow brushes are really good choices. One for all over colour and blending, and the other for detailing the contour and crease and smudging. The brush they’ll tell you is for lining, use it for filling in your brows if you don’t want to hurt your eyes – I do that and it works a treat. Whilst the Shu Uemura set feels better in quality, you would only be enjoying its benefits if you get the RM300 full size version in the seriously ugly case (to me 😛 ). I wouldn’t bother with the portable version because the blush brush is just too small unless you have a small face then it would make sense. Otherwise, I’d just skip it. If you are in the market for a brush set, try and check out both sets if you can, before commiting to either. I never expect much from a brush set because I know the quality just isn’t as good as what it could be in the full sized version, but it isn’t crap either, and makes a good starter set to build upon. Either way, both sets are limited edition and selling out fast so make your minds up quickly! i was at MAC yesterday, and the brush sets just bores me. shu’s brushes are better, but like you, i don’t really like the rose theme all over. BB face/kabuki brushes get scratchy over time but eye brushes are great. it depends on what did they out in that set. but 300 for 6 is definitely a much better choice, even if they are mini sized (are they?) as BB makes their mini same standard as the full sized ones. Can I add Bobbi Brown makes great travel brushes? My bestfriend bought it and used it on me..I LOVE IT!!!! I haven’t tried MAC travel brush set and Shu! @jojoba : Ah the girl must have been mistaken then coz I double checked all prices before I left. From my limited experience with Bobbi Brown brushes they are great quality and for the same price as Shu Uemura is decent. I’ve been looking into getting a holiday brush set for myself recently, so this article was timely 😀 – thanks!! Like some of the other commentors, I’m mostly looking for a nice portable/travel/mini brush set – Laura Mercier and Bobbi Brown’s got at least one of those this year, but I haven’t seen them for myself yet, so can’t comment on look, feel or price. I’m with Plue; I saw the Adoring Carmine brush set last week, and I thought it was … eh. Love the colour, not the price tag. And yeah, when I tried out the brushes, the stipling brush was already shedding. Don’t think it’s worth the AUD110 lor. @Synical: I’ve never really been impressed by Laura Mercier brushes before and LM does tend to be pricey. So between the two, I’d say Bobbi Brown only because I’ve seen their sets before and they have been decent. @Tine: LOL looks like their quality is all touch and go. @Engmin : Fully agree with you on all counts re: easy to clean but damn! Those flowers give me a headache! anyway i’m glad to hear that the eye brushes in the basic brush set are good, because those are the ones i’m most interested in. as for the skunk brush, it’s great not just for liquid foundation, but also loose powder and blush, both cream and powder. This time I didn’t have any luck with MAC’s SAs (My last 2 posts mentioned it), but I saw their holiday collection- brushes, eye palettes and lip palettes. I usually quite love MAC’s brushes but they’re too pricey for me at the moment, but the LE brushes didn’t attract me. The quality does feel different from the full-sized ones. Like you, I ran by MAC and Shu to have a look at their collections recently and I agree with you. MAC looks good but the brushes aren’t that great. Shu has great brushes but I CAN NOT bear the sight of that ugly pouch. WHY oh why did they have to put lovely brushes into a pouch like that? Sigh.. The MAC brushes which come in the brush sets are definitely of lower quality than those you’d buy individually, even if the brush heads are of the same size. And as for the brushes not being as soft, I doubt it has anything to do with washing. I believe the quality of the hair is altogether different. oooo im so glad i found your blog! im getting the MAC Eye brush set soon and Im so glad to have read your review! all the holiday brushes are so gorgeous isnt it! @Jooj : I am a firm advocate of coloured eyeshadows so yes you should try it 🙂 Hope you like your brush set.